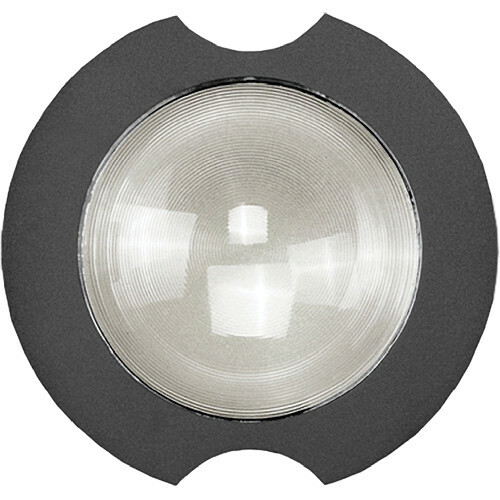 The 2" Fresnel Lens from Fiilex is designed to attach to the to the front of the P360 and P360EX fixtures and the V70 Viewing Light. It allows you to focus the beam of light to approximately 29° while intensifying the light by roughly three times. Box Dimensions (LxWxH) 3.25 x 3.25 x 0.5"
2" Fresnel Lens for P360/EX and V70 LED Lights is rated 3.8 out of 5 by 12. Rated 4 out of 5 by Anonymous from Works well, but should come with a case... This may be picky, but when I opened the box and found that I'd paid $$$ for a plastic lens, I was very disappointed that it didn't come with any kind of pouch or case. It would be great if they spent a little less on the cardboard packaging and gave me something that will protect it against scratches. It's fine when it is on the light, but if you have a lot of Fiilex accessories you'll need to find a good way to protect them. Lightweight plastic doesn't feel very professional or durable. Rated 4 out of 5 by Adrian from Works well, pricey for plastic I was surprised that this lens was all plastic (based on the price), but I am very satisfied with its performance. I would like it to come with a case to protect it from scratches or breakage when it is not in use. It's thin enough to leave it on the light when in the light kit's hard case, but that means that if you're not using it you have to find a safe place for it when you remove it from the light. Rated 4 out of 5 by Zak from More power Increase the output of the Fiilex 360 by focusing the light it outputs. This is lightweight, clips on with magnets, and holds on tight. A useful accessory that increases the function of the light even further. Rated 5 out of 5 by MM from Great, adds intensity This drop in Fresnel adds about a stop to your exposure..and in some cases up to 20% more power. Use this even with the dome diffuser to add more power. Rated 5 out of 5 by Vitaliy from Must have This little guy is a must for your P360/P360EX lights. The light has a diffuser/led blender that makes the light scatter too much. With this lens the light works like a soft spotlight with strong center focus and a feathered fall-off that can be controlled effectively with included barn doors. Spectacular little lens and the magnetic mount is a charm making placement and removal easier than any other product ever owned. Rated 3 out of 5 by Jon from Underwhelming yet Overpriced Like everyone else....it's very overpriced. Adding this lens does focus the fiilex lights, but even with them attached, you're getting approximately the same beam angle as you would an arri fresnel on it's flood setting. Furthermore, the light still doesn't cut as sharply as an arri fresnel. Regardless, I keep these on my p360 lights pretty much at all times, since I normally use them more as spot lights anyways. Rated 1 out of 5 by Guy from Overpriced and ineffective This additional plastic Fresnel add-on. Does not have any use in creating sharp adjustable shadows. It sits on the front of the lens (with magnets) and gives a minimum effect on the light beam. Very expensive for what it is supposed to do. Not worth the money. does it fit the p180? Hi Gustavo, Yes this does fit the P180. It mounts when the barn doors are on the P180 as the magnets are on the base of the barn door.